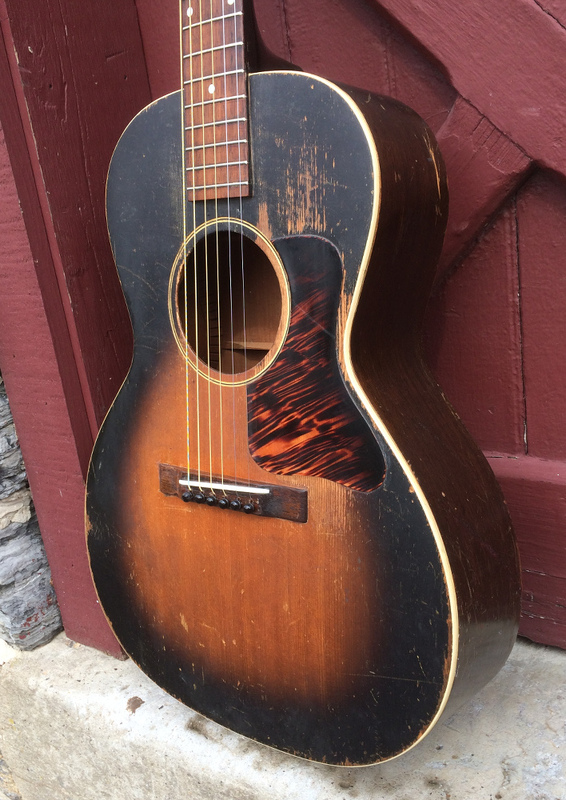 Gibson L-00 1936 | HOLD | This 1936 L-00 is a solid example of a popular and successful Gibson pre-war flat top acoustic. The 'B' stamp is all but discernible on the heel block, along with the FON, which enables us to date the guitar to '36. Additionally, the Grover 'open book' tuners were used in the '36-'37 time frame. The guitar conforms to the typical specs of a mid-thirties L-00. 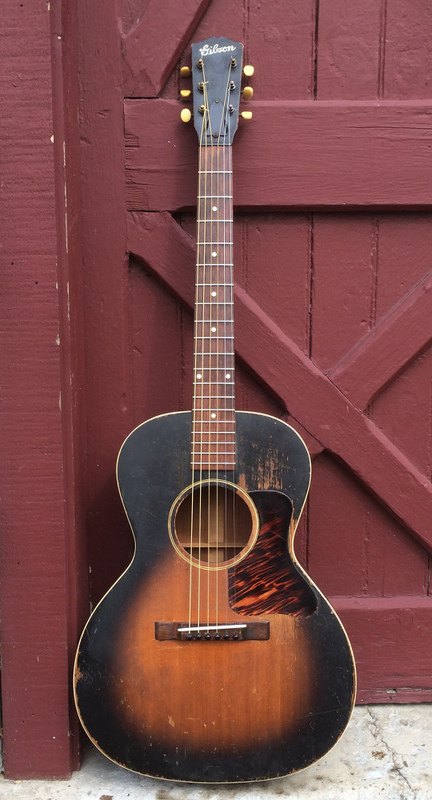 Spruce top with the classic Gibson sunburst, mahogany back and sides, and mahogany neck. The fingerboard is Brazilian rosewood, and the headstock is painted black and sports the 'Gibson' logo in white script. The neck is carved to the typical 'V' of the period and is very comfortable in the hand. The guitar retains its original 'fire stripe' pick guard, Brazilian rosewood bridge and Grover 'open book' tuners (the bass side strip is not original to the guitar but of the period). The ebony nut is original, too. Scale length is ~ 25 1/16" and the neck measures 1 3/4" at the nut. Action is set at 6/64" at the 12 fret, and the guitar plays with ease. 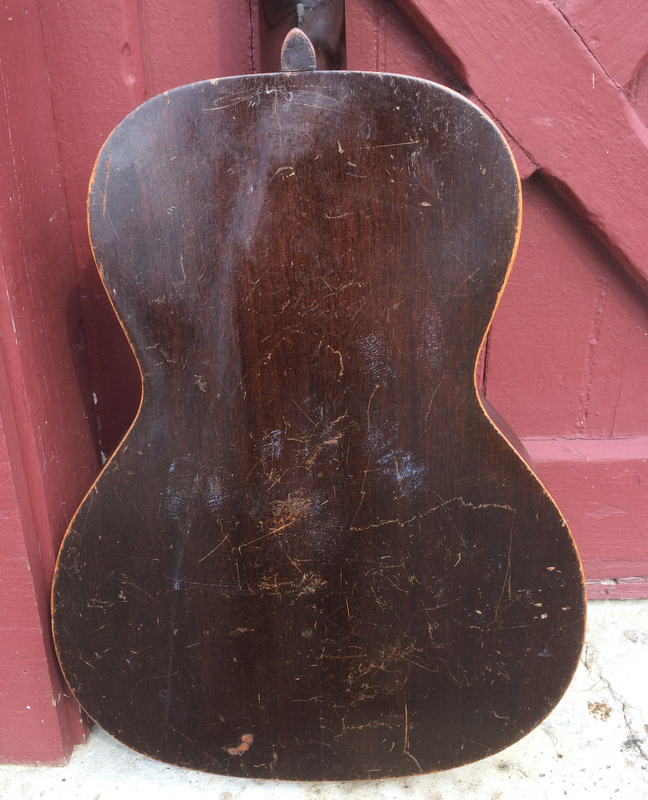 The guitar shows a beautiful, unbuffed patina, with lots of overall wear, dings, and nicks from a life well lived. Amazingly, no cracks are apparent. Bridge pins appear original and the end pin is missing. The only repairs was a recent neck reset and a new bone saddle. The guitar produces beautiful, well-balanced tones .. better than most we've owned, and a pleasure to play. A sound, crack-free L-00 representing great value in the market. Comes with a new tweed-style hard case.